Want to quit smoking? Here's a tip—try e-cigarettes. According to countless people who've tried them over the years, they actually seem to work. Unfortunately they also seem to explode! Recently an E-cigarette exploded in a man's mouth, blowing out teeth and inflicting extensive injuries to his face. Its really quite scary lightening up a self help device and getting fried for your troubles. There was nothing funny about the ghastly injuries to his face though. Andrew Hall from Idaho in the US, was inhaling from the device when the incident happened. As well as losing several teeth, Hall was left with ‘chunks of plastic’ wedged into his face and second degree burns. Gruesome ordeal. He revealed the extent of his injuries in a Facebook post. The e-cigarette explosion was so bad it damaged part of his house. Images show an extensive amount of damage to the bathroom, where Hall was vaping, including a smashed sink, blood-splattered tiles and fire damage on the walls. After the horrific incident, Hall Wrote on social media urging fellow vapers to think twice before picking up their device. 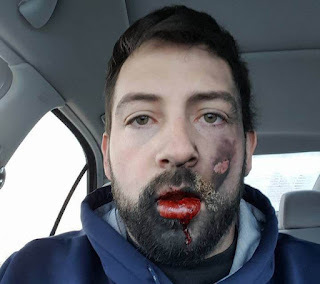 Here's what he said: ‘I’ve been vaping for about a year now and assure you I did not do anything I wasn’t supposed to – but it exploded in my face. I’ve lost at least 7 teeth, second degree burns to face and neck and have been pulling chunks of plastic, teeth and foreign objects from mouth, throat and lips. ‘I was lucky and they’re was a huge amount of damage to the room in my house I was in as well. ‘I know vapes help people quit smoking cigarettes and that’s amazing. I just want to bring to light this is possible that they can explode without warning. The dangers of cigarette smoke or the horrors of exploding e-cigarettes—Your choice.